Low intensity (< 2 Vpp/cm (peak to peak voltage/cm)), high frequency (10–30 MHz), and 10 min alternating electric fields (sine wave with no DC component) induce non-contact and enzyme-free cell detachment of anchorage-dependent cells directly from commercially available cell culture flasks and stack plates. 0.25 Vpp/cm, 20 MHz alternating electric field for 10 min at room temperature (RT) induced maximum detachment and separated 99.5 ± 0.1% (mean ± SEM, n = 6) of CHO-K1 and 99.8 ± 0.2% of BALB/3T3 cells from the culture flasks. Both vertical and lateral alternating electric field applications for 10 min at RT detach the CHO-K1 cells from 25 cm2 culture flasks. The alternating electric field application induced cell detachment is almost noncytotoxic, and over 90% of the detached cells remained alive. The alternating electric field applied CHO-K1 cells for 90 min showed little or no lag phase and immediately enter exponential phase in cell growth. 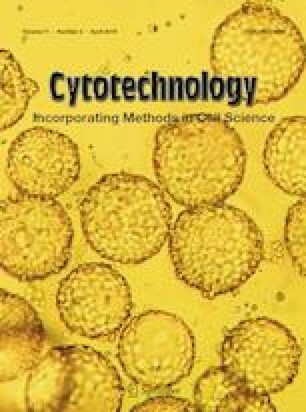 Combination of the 20 MHz alternating electric field and enzymatic treatment for 4 min at 37 °C showed synergetic effect and quickly detached human induced pluripotent stem cells from a laminin-coated culture flask compared with the only enzymatic treatment. These results indicate that the rapid cell detachment with both the electric field application and the enzymatic treatment could be applied to subcultures of cells that are susceptible to prolonged enzymatic digestion damage for mass culture of sustainable clinical use.